At FOSDEM, Alfred (ams@gnu.org) came up with the idea of “Autocache” – a system-wide precomputed cache of autoconf tests that makes every configure script run instantaneously. A crazy idea that cannot work completely in practice, of course, but there might be something to it. He sent me an implementation which works like this: you make a configure script from all the autoconf tests in Gnulib (excluding some obvious ones that should not be cached). The idea is to pick tests which are unlikely to change on a given system. You run this huge configure script once and make a copy of the resulting config.cache file. You then use this as an initial config.cache for any package you’re compiling. I tested it on GSRC and it worked surprisingly well – out of ~100 packages there were only a handful of failures where somehow the cache had bad results. 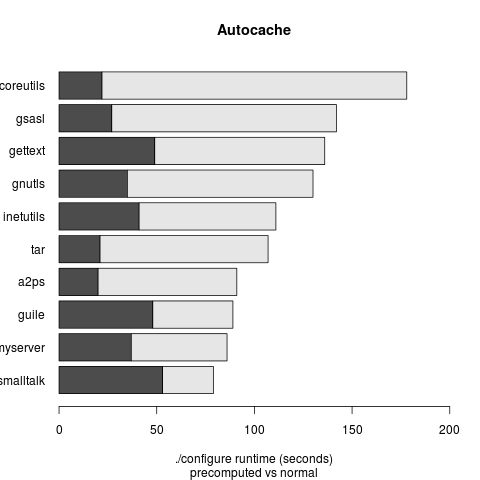 Here are the timing results for the top ten longest-running GNU configure scripts with/without autocache.